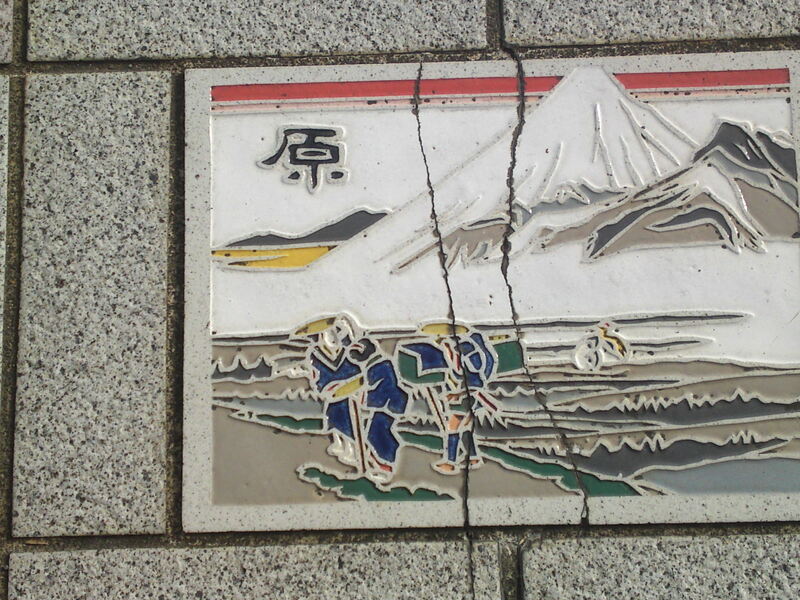 Utagawa Hiroshige/歌川 広重 (1797 – 12 October 1858) (real name: 安藤 広重/Ando Hiroshige) is probably the most famous ukiyoe/woodblock print artist when it comes to describing travel scenes in Japan. 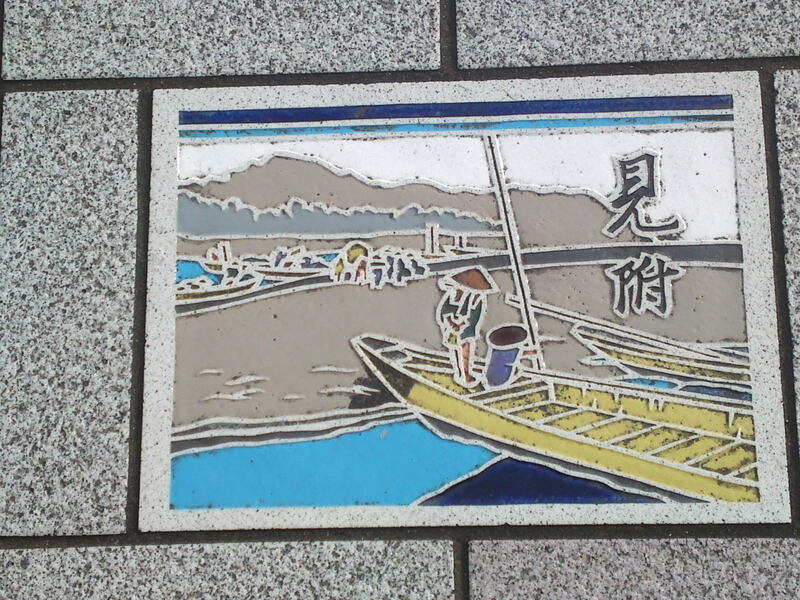 When it comes to Shizuoka Prefecture where a Museum is dedicated to him in Yui, Shimizu Ku, Shizuoka City, the Fifty-three Stations of the Tōkaidō immediately come to mind. 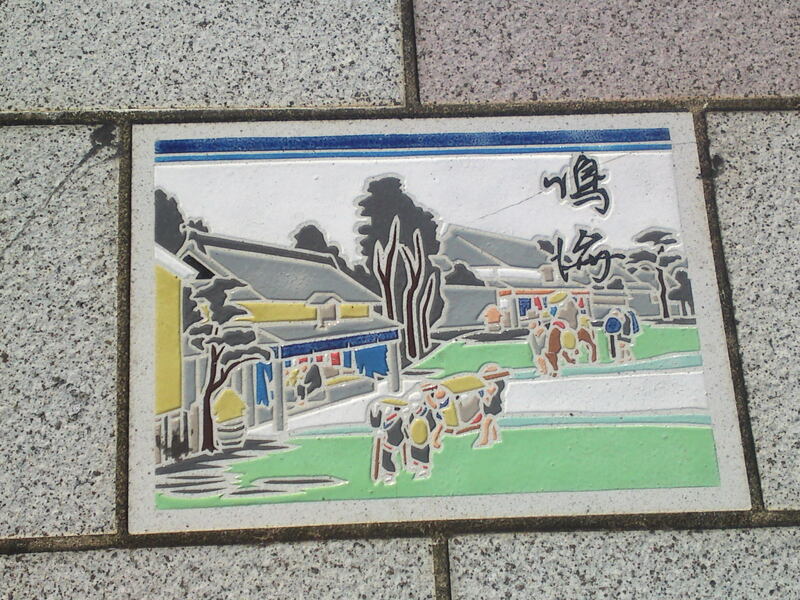 And if you look carefully you will find them represented in the most unusual places! 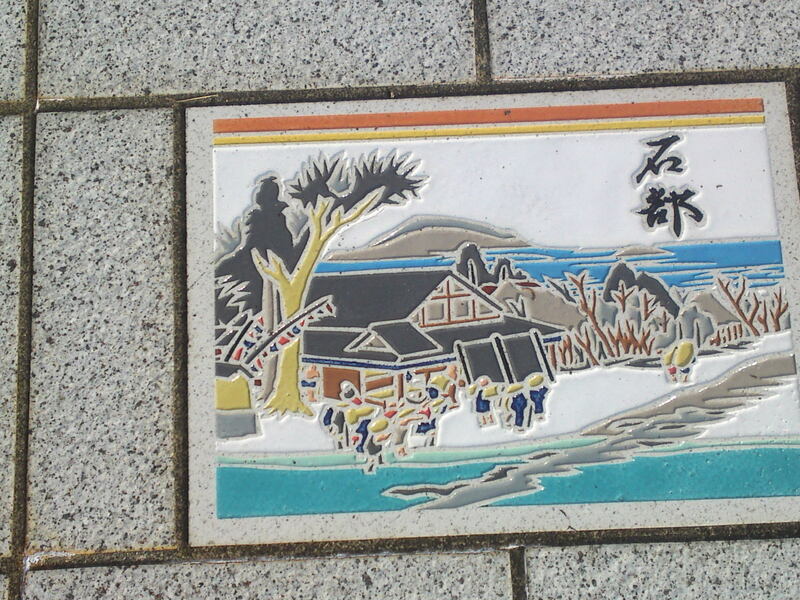 Now, take the Tokaido Railway Line and get off at Shin Kambara Station in Shizuoka City, Shimizu Ku! 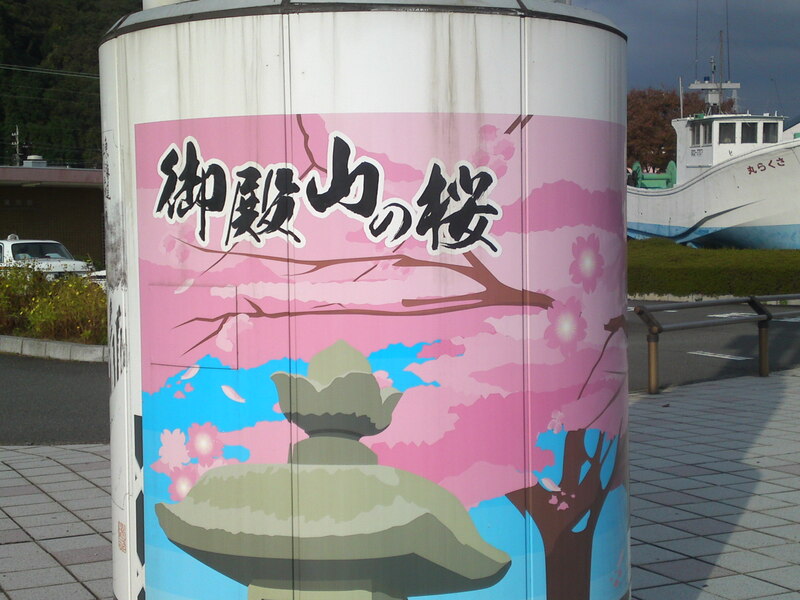 The place is famous for its cherry trees. 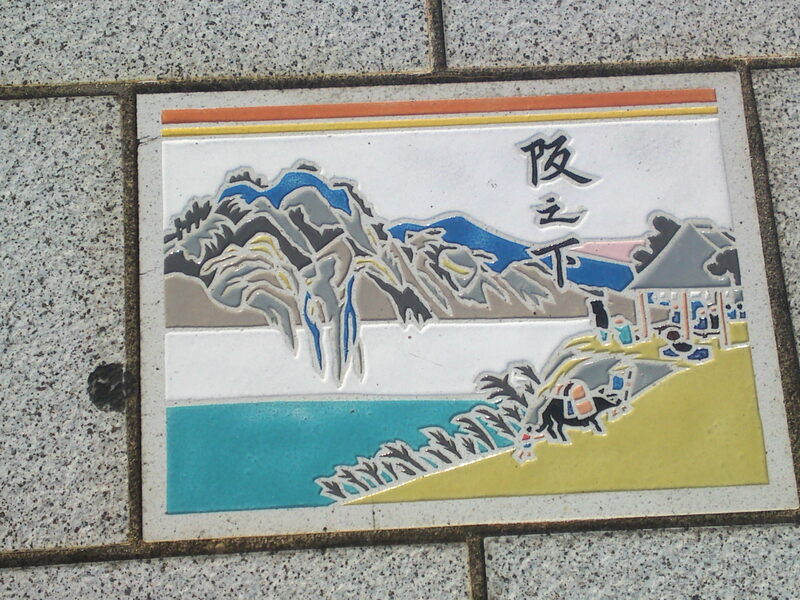 Did you know that the cherry trees offered to the US in Washington are all the scions from a single tree from nearby Okitsu, Shimizu Ku, Shizuoka City! 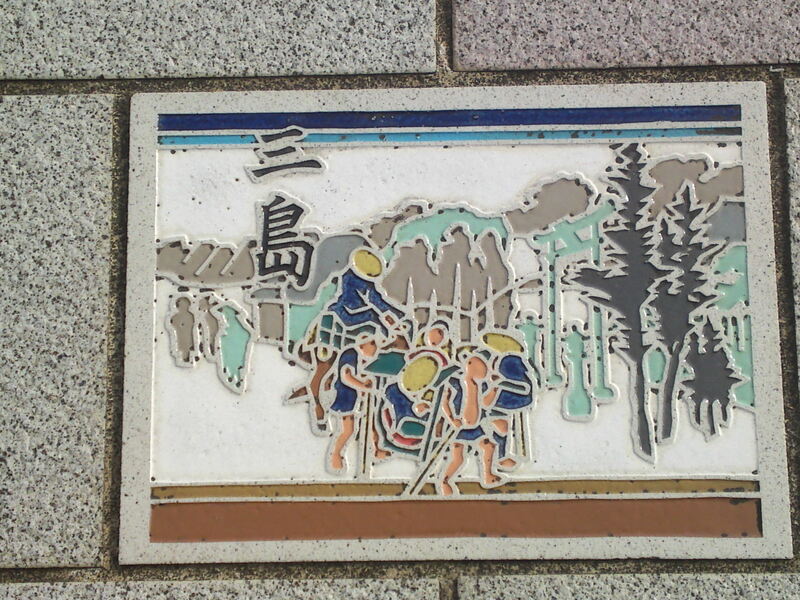 Travelers of yore added onto one of Utagawa Hiroshige’s prints! 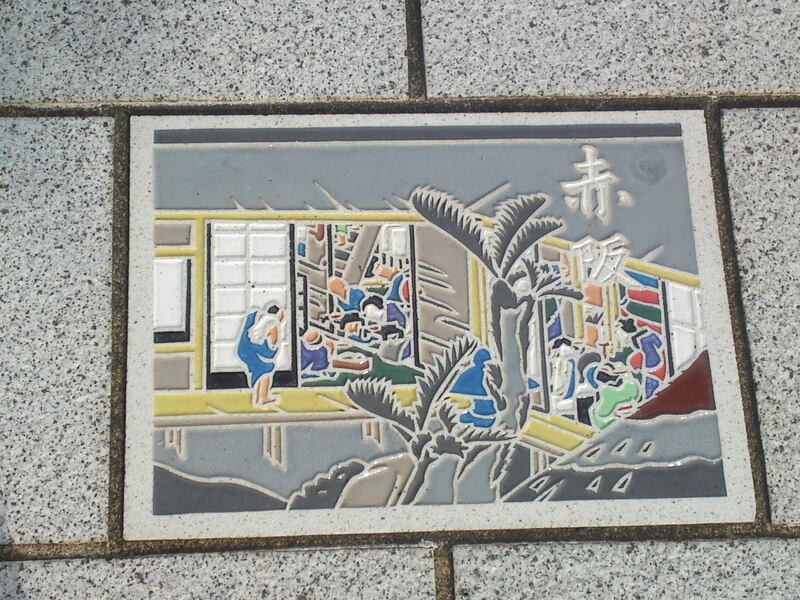 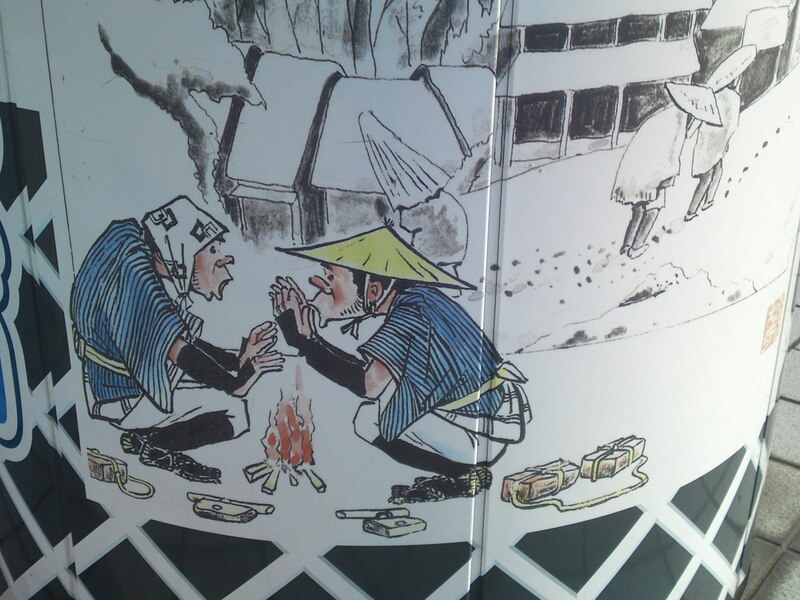 Now go the pavement along the station and you will discover the world of Edo at your feet! 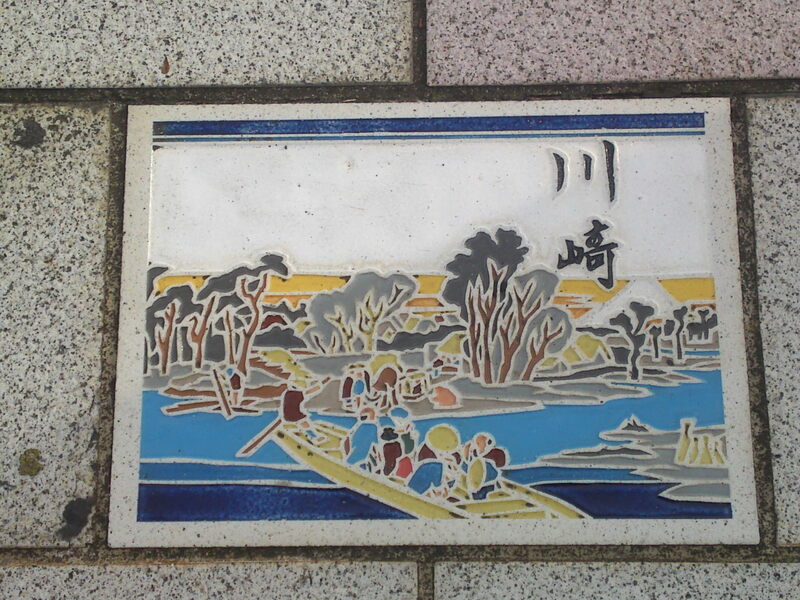 Find this set of tiles and proceed to its left to discover them all in their right order! 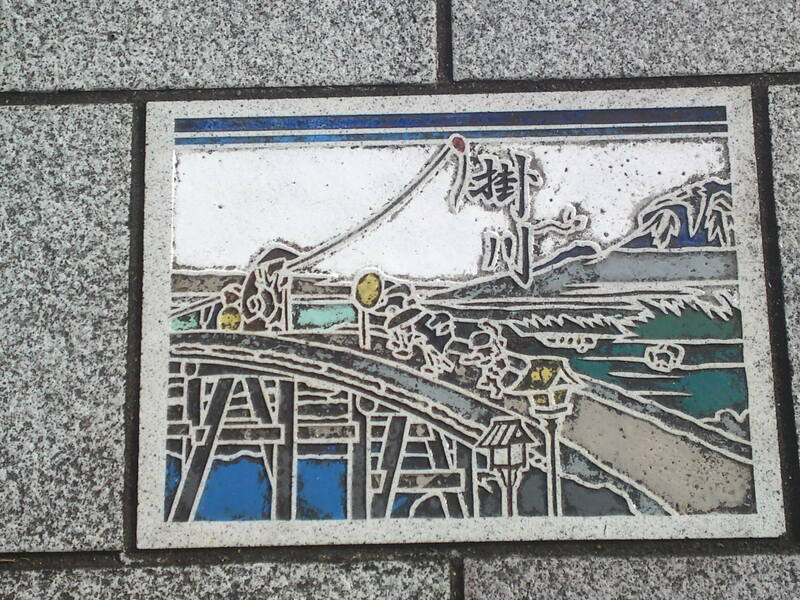 Leaving Edo : Nihonbashi, “the bridge of Japan”! 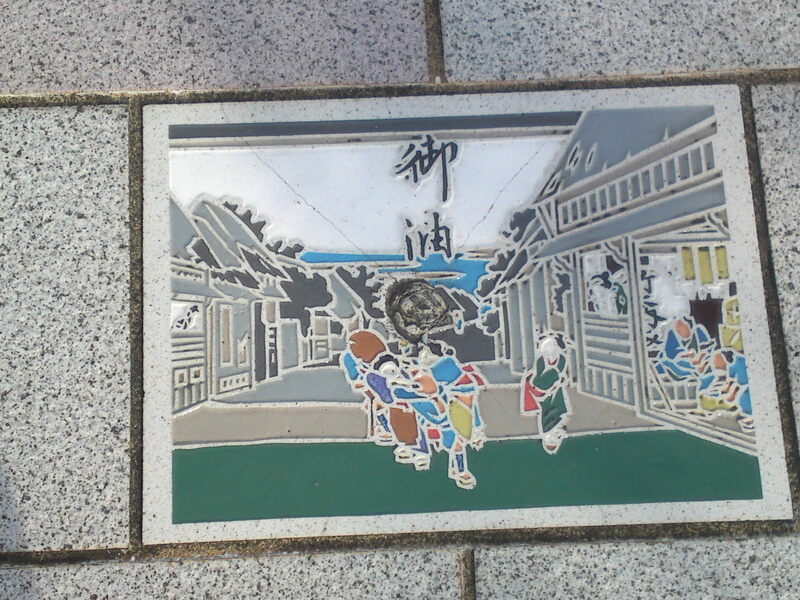 We are still in present Tokyo! 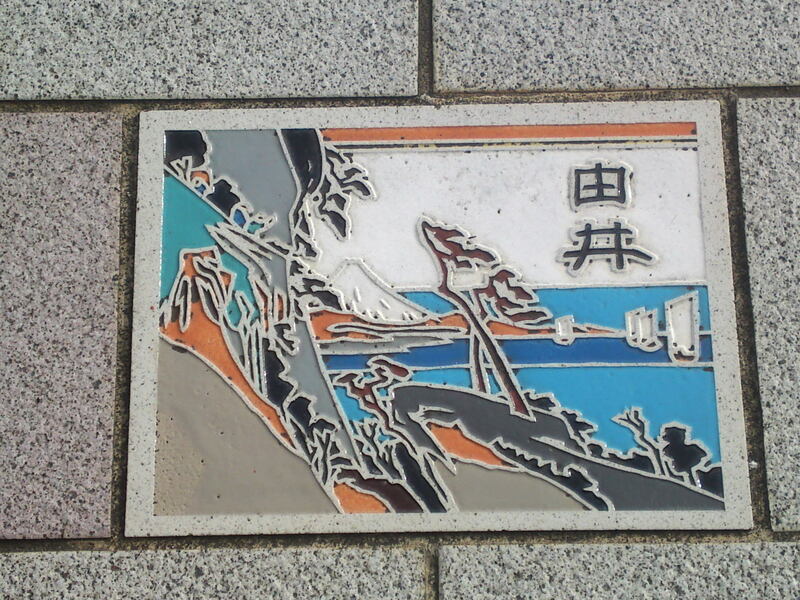 3rd station : Kanagawa (presently in Kanagawa Ku, Yokohama City)! 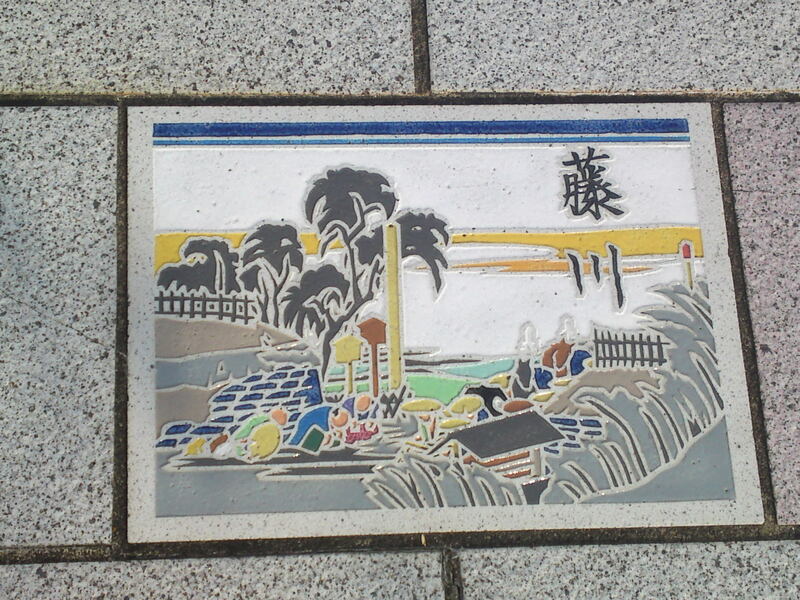 4th station : Hodogaya (presently in Hodogaya Ku, Yokohama City)! 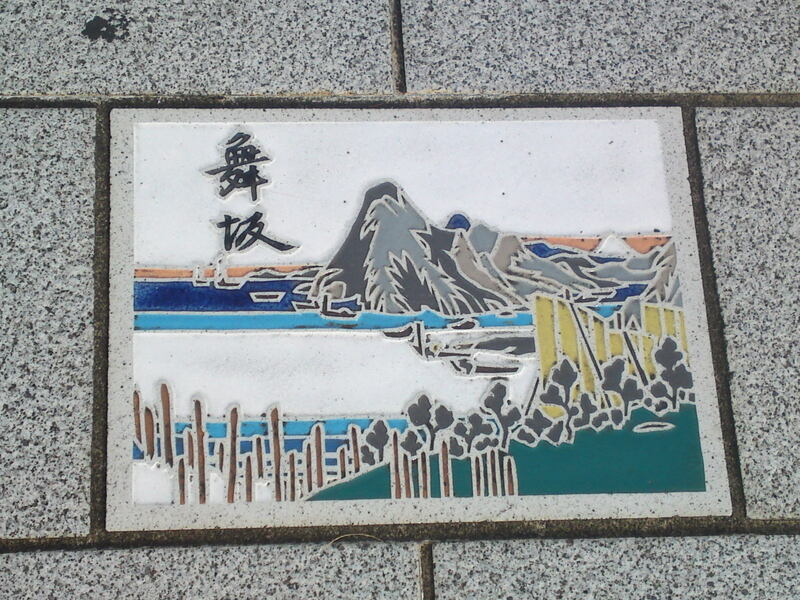 8th station : Oiso (presently in Naka District, Kanagawa Prefecture)! 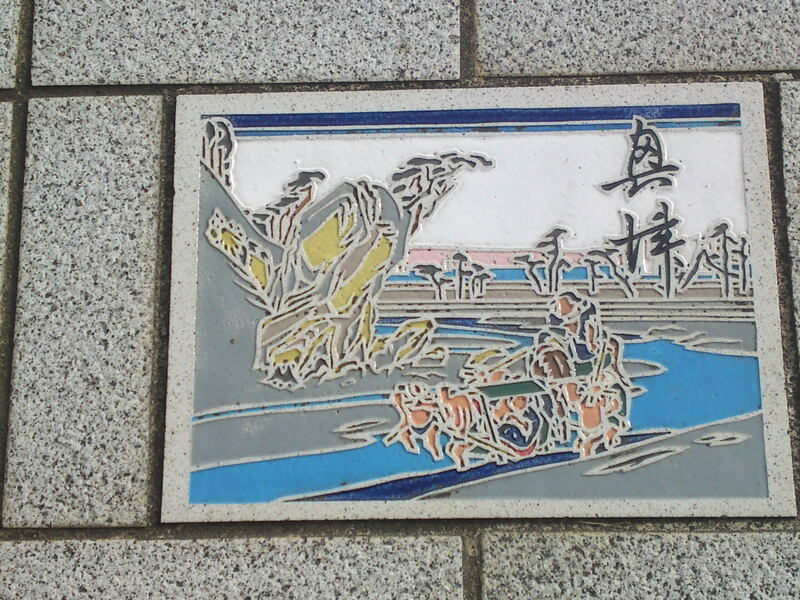 9th station : Odawara (Crossing the Sakawa River at a ford.)! 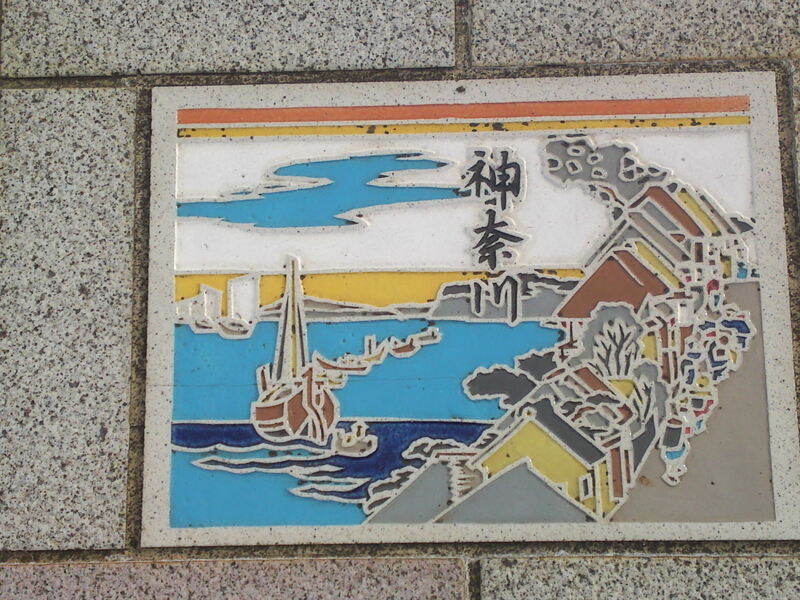 The last station inside Kanagawa Prefecture! 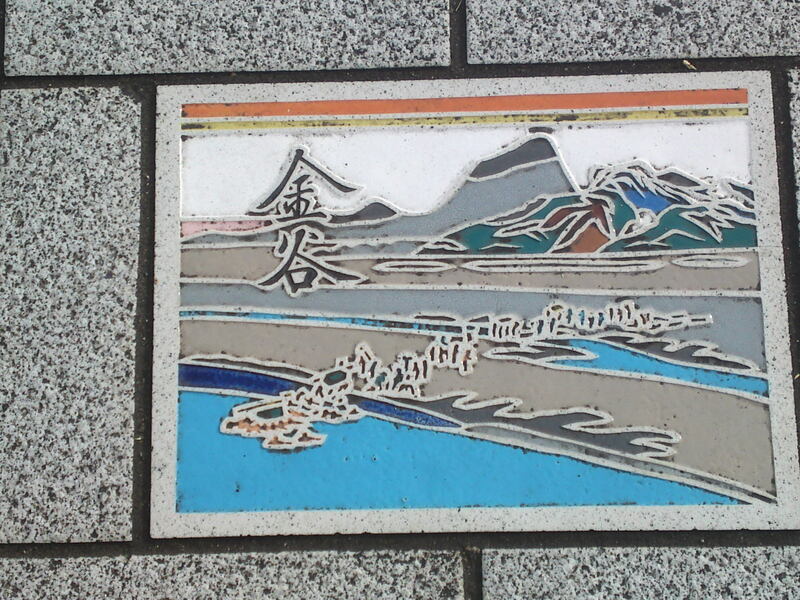 13th station : Hara (presently in Numazu City)! 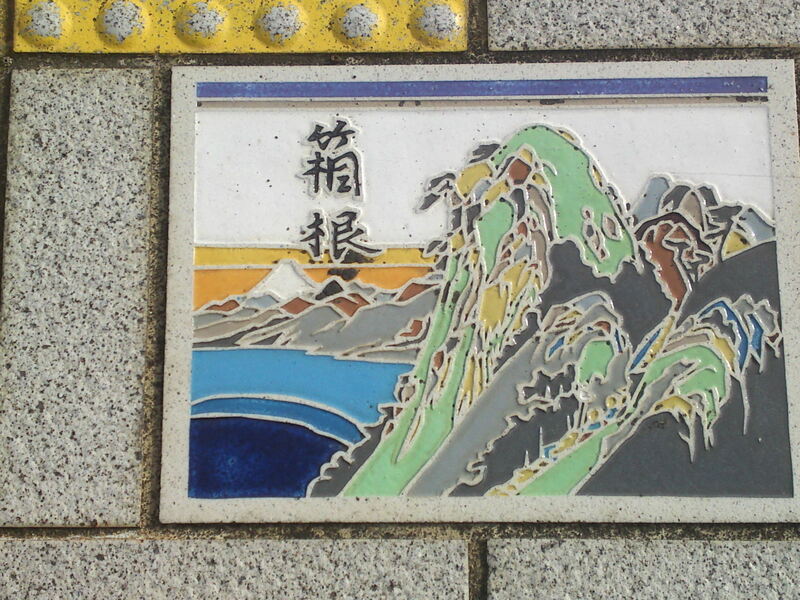 14th station : Yoshiwara (presently in Fuji City)! 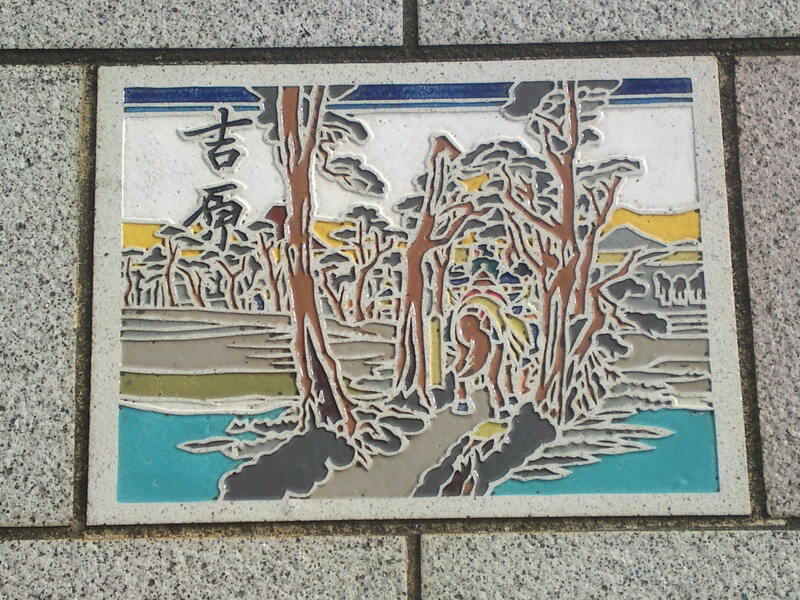 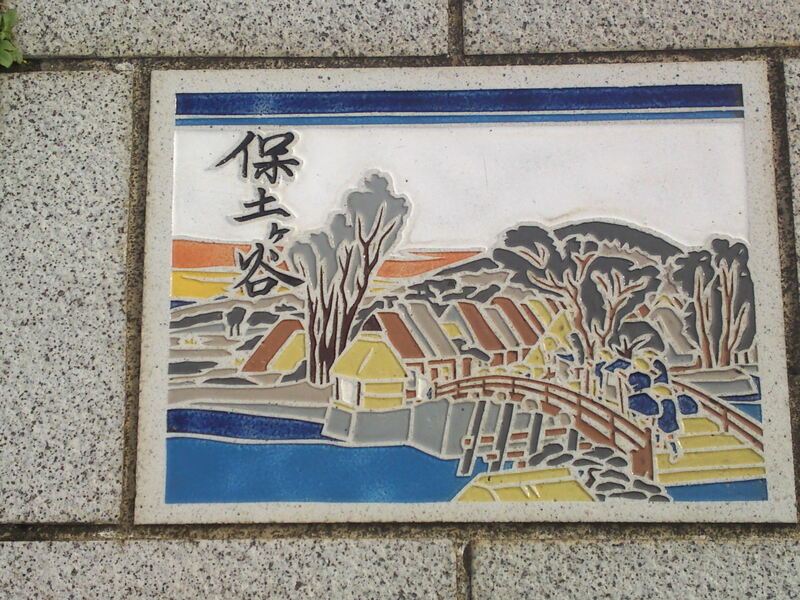 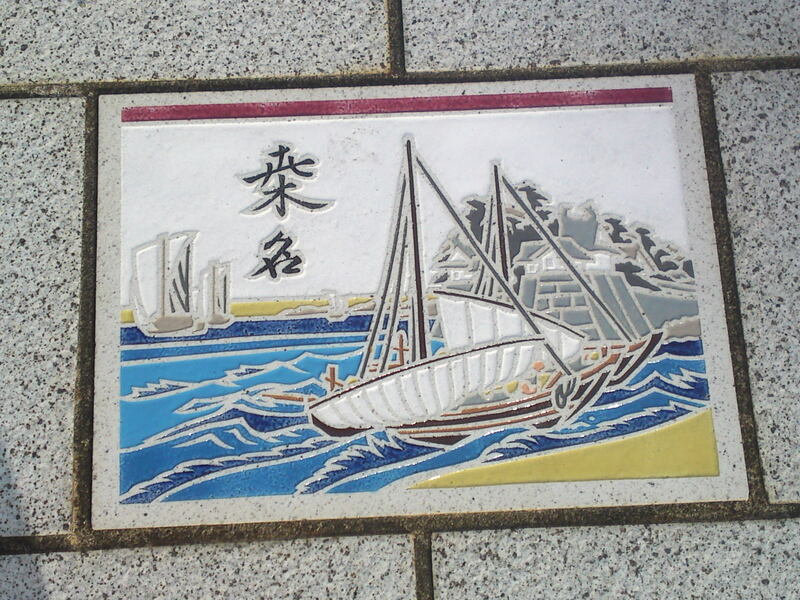 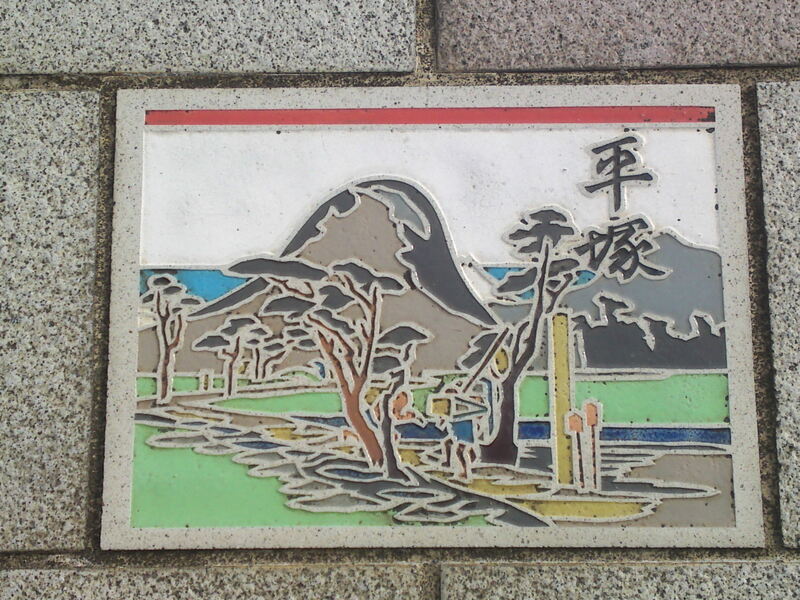 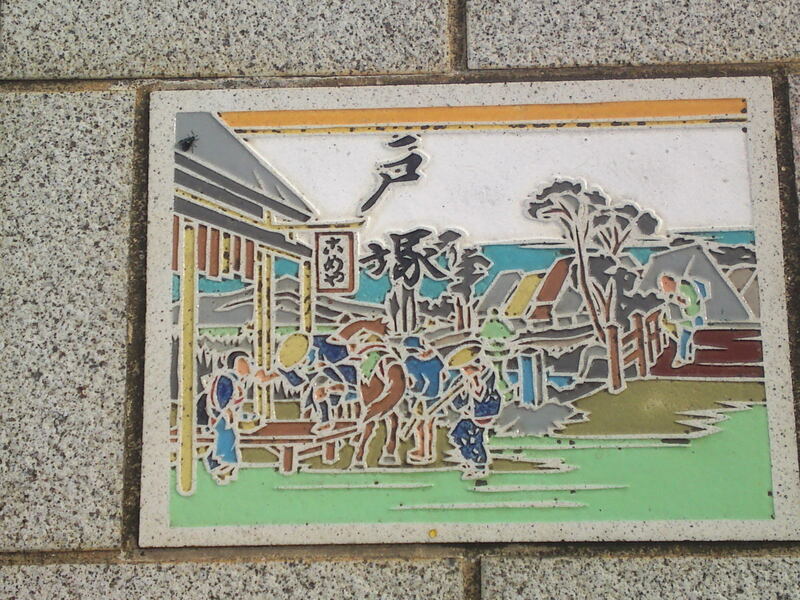 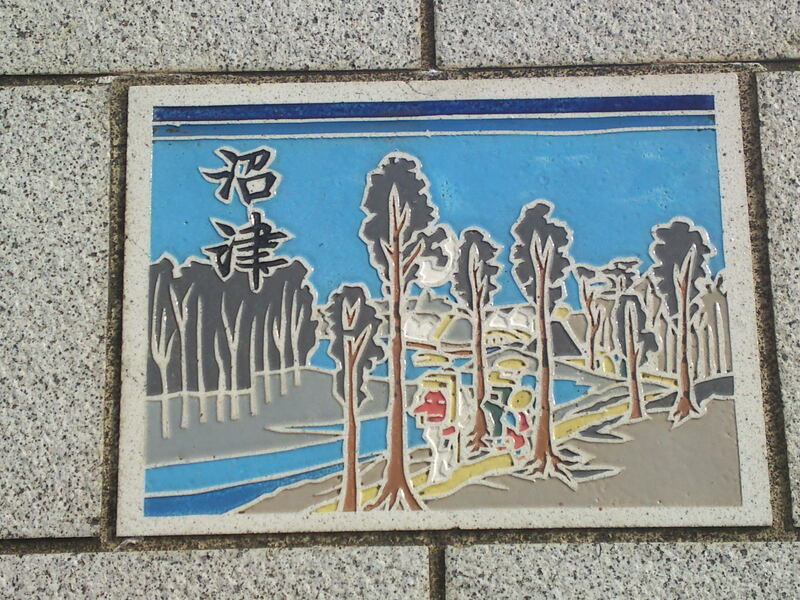 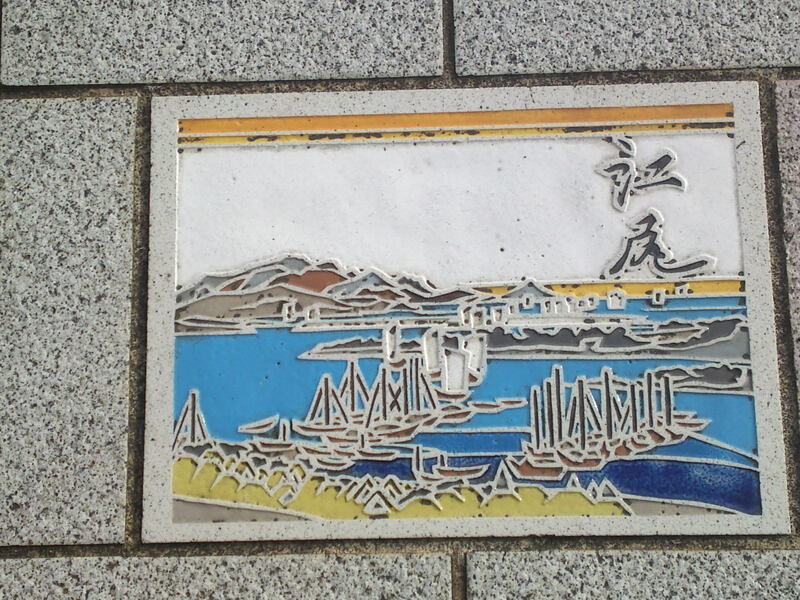 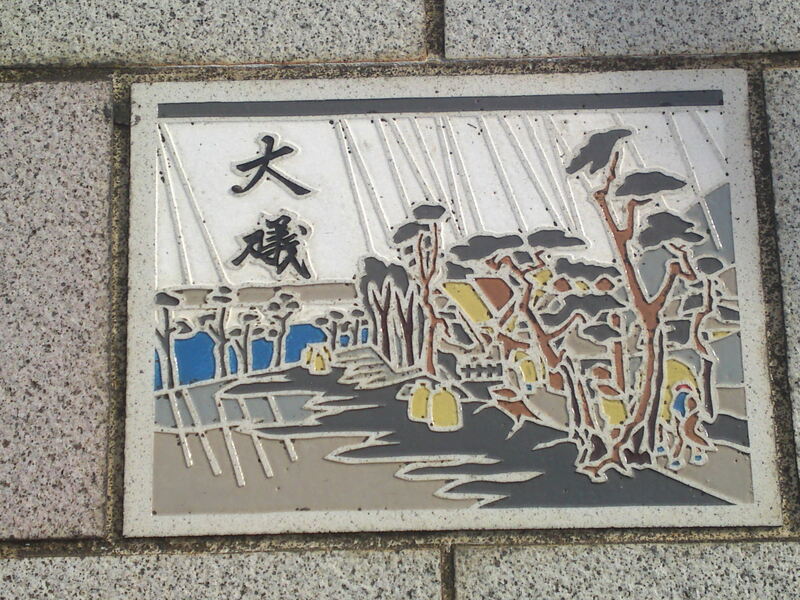 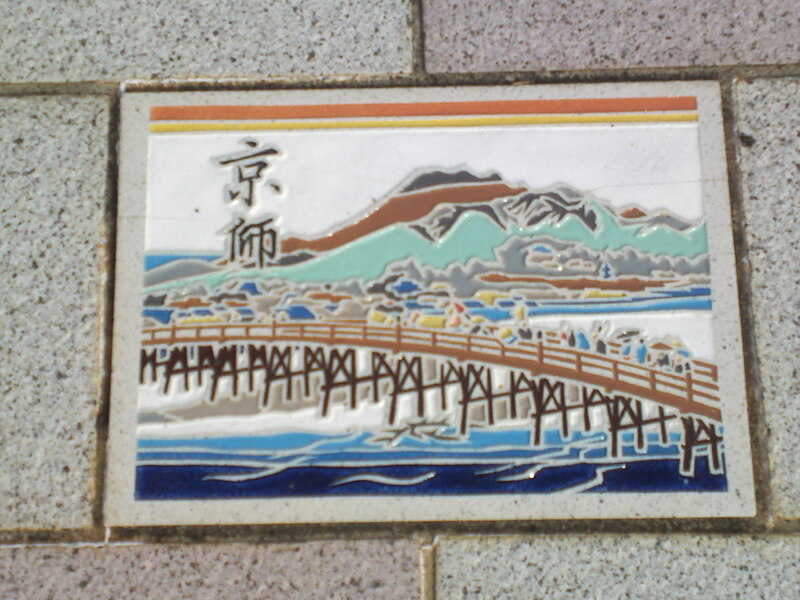 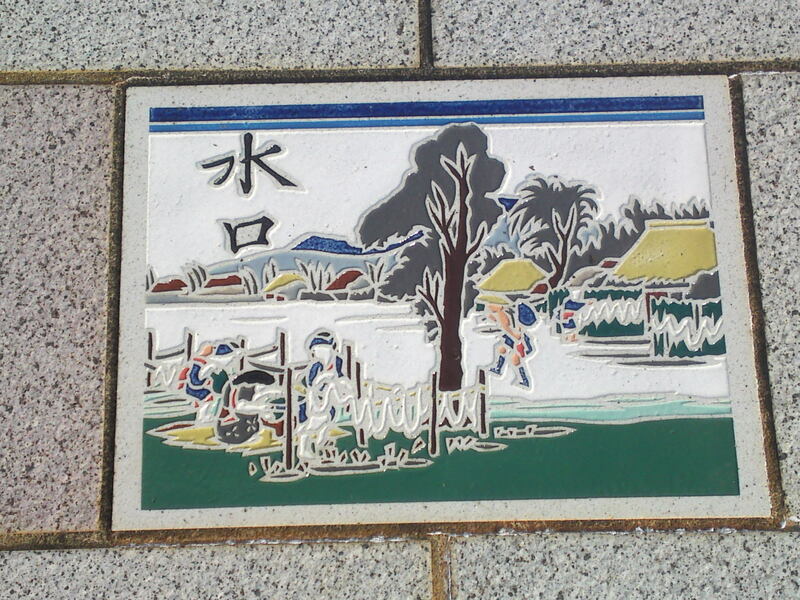 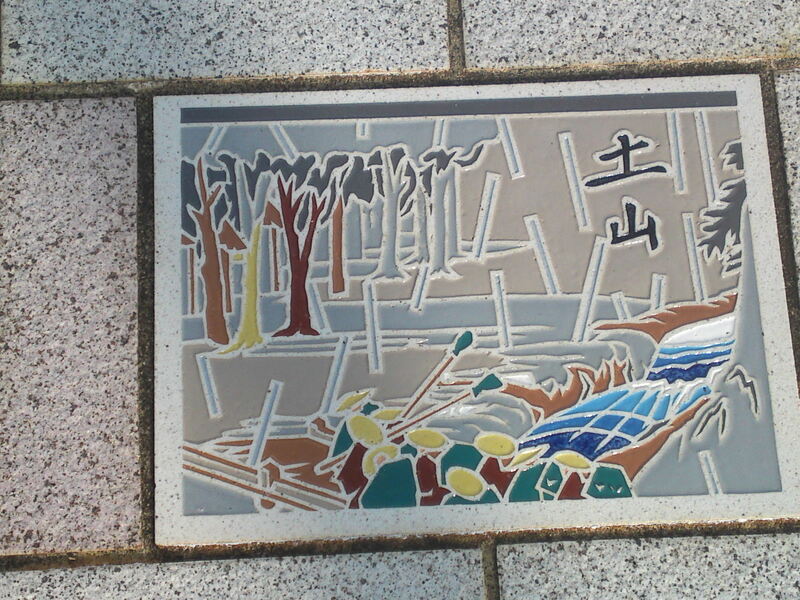 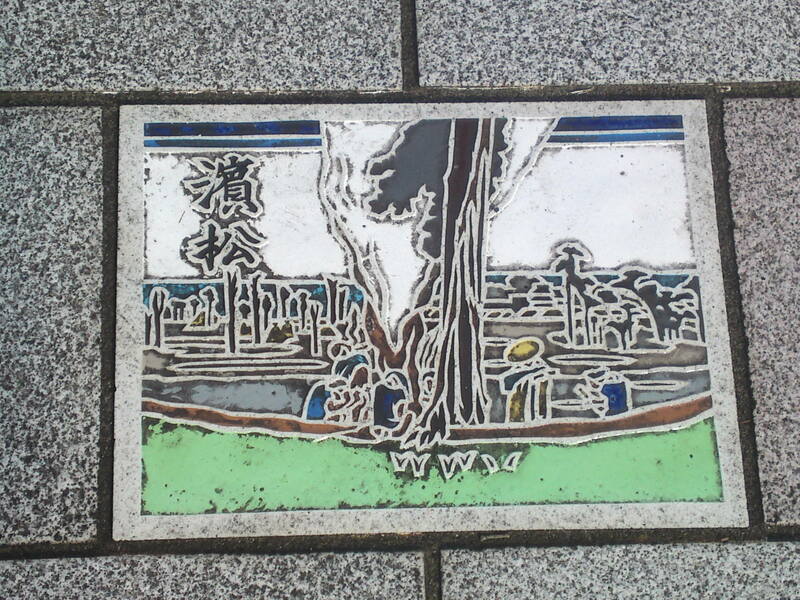 15th station : Kambara, the main tile (Shin Kambara is part of Kambara, Shimizu Ku, Shizuoka City)! 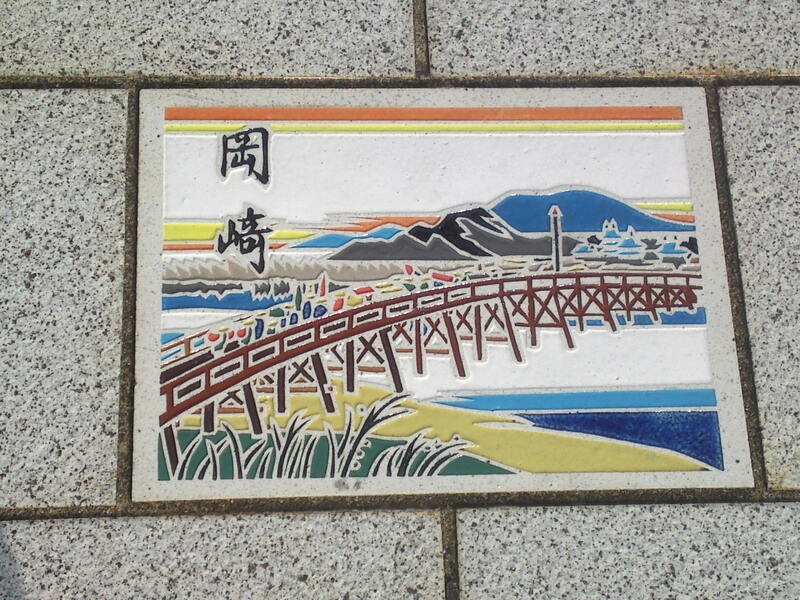 16th station : Yui (presently part of Shimizu Ku, Shizuoka City)! 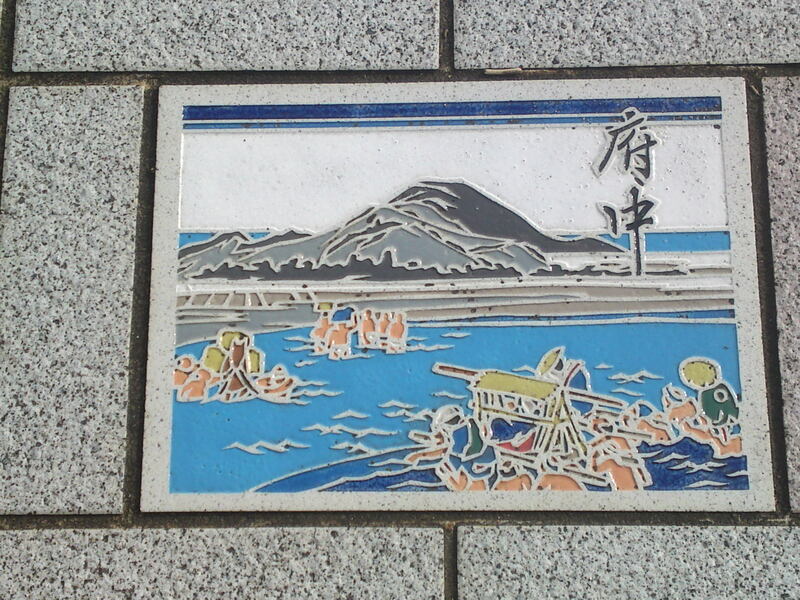 17th station : Okitsu (presently part of Shimizu Ku, Shizuoka City)! 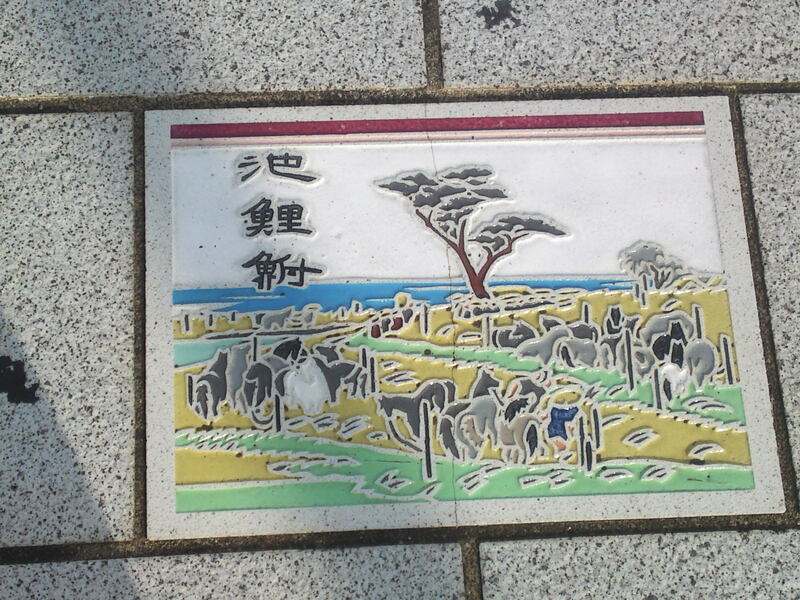 18th station : Ejiri (presently part of Shimizu Ku, Shizuoka City)! 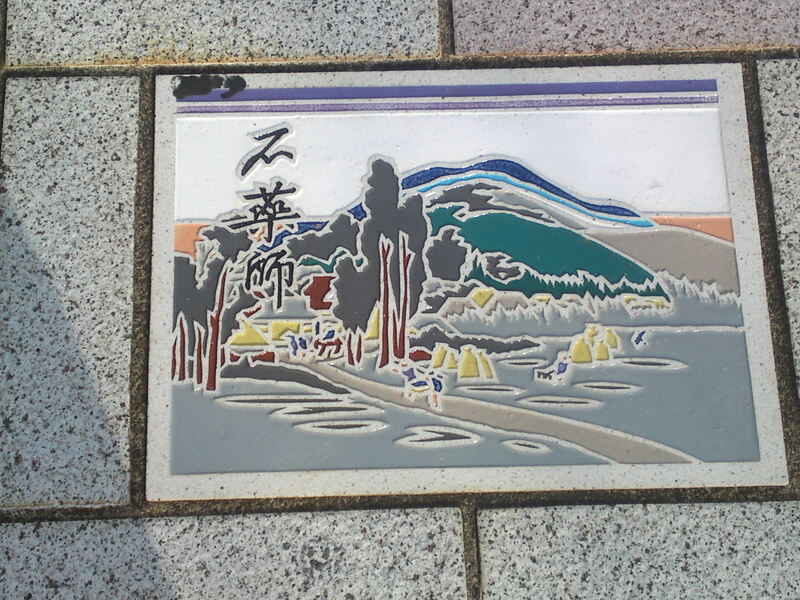 19th station : Fuchū (old name of Shizuoka City)! 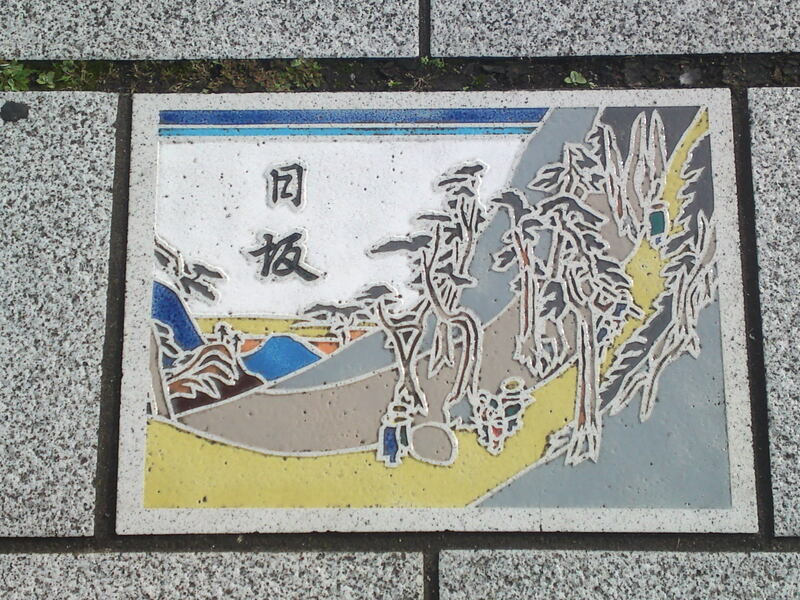 20th station : Mariko (presently in Suruga Ku, Shizuoka City)! 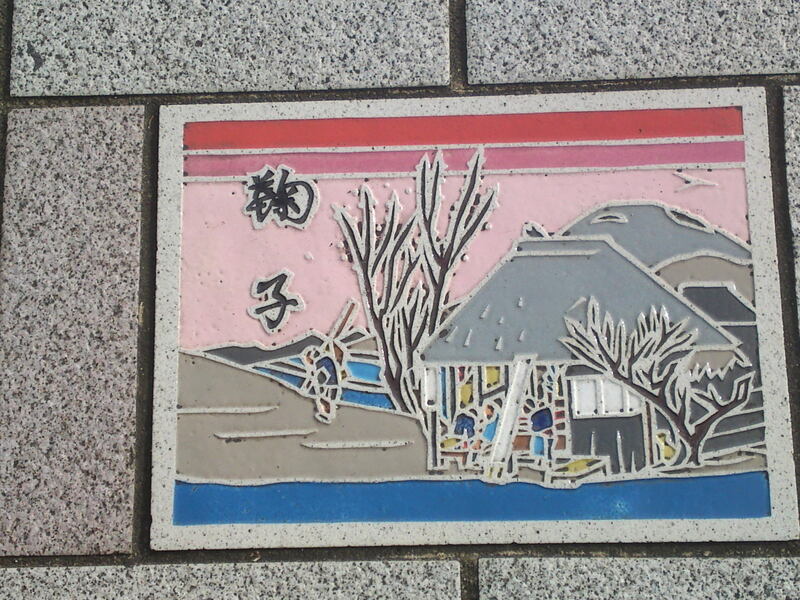 21st station : Okabe (presently in Fujieda City)! 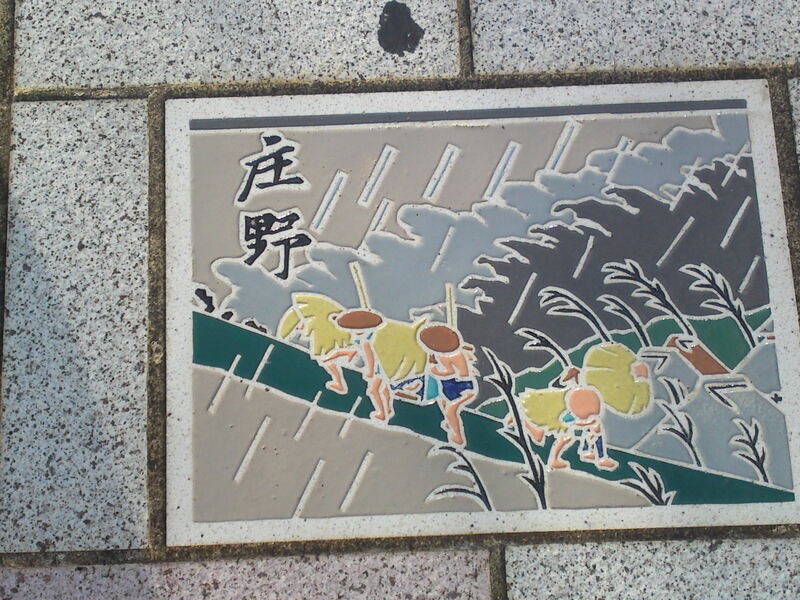 24th station : Kanaya (presently in Shimada City)! 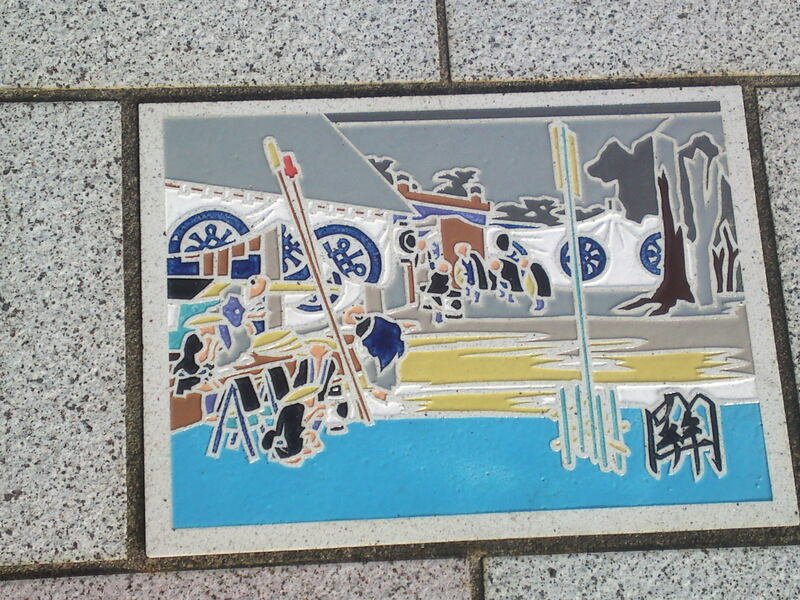 25th station : Nissaka (presently in Kakegawa City)! 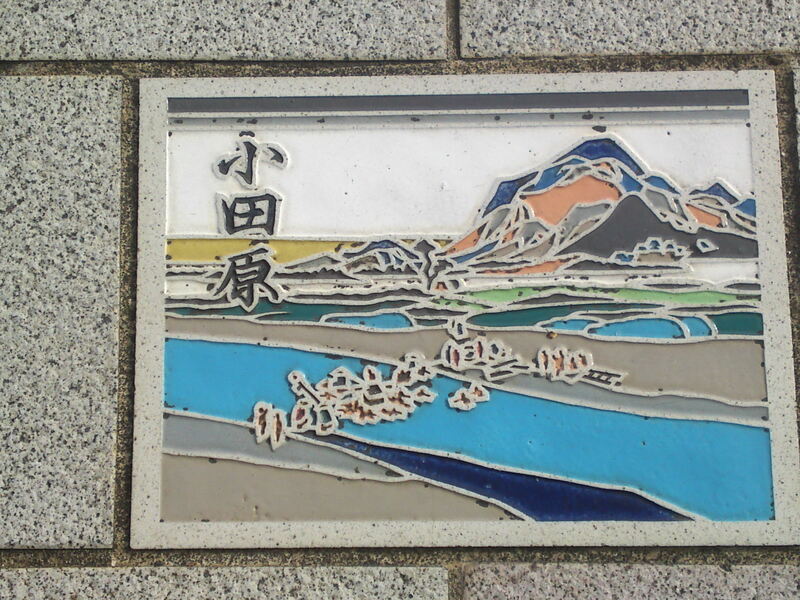 28th station : Mitsuke (presently in Iwata City)! 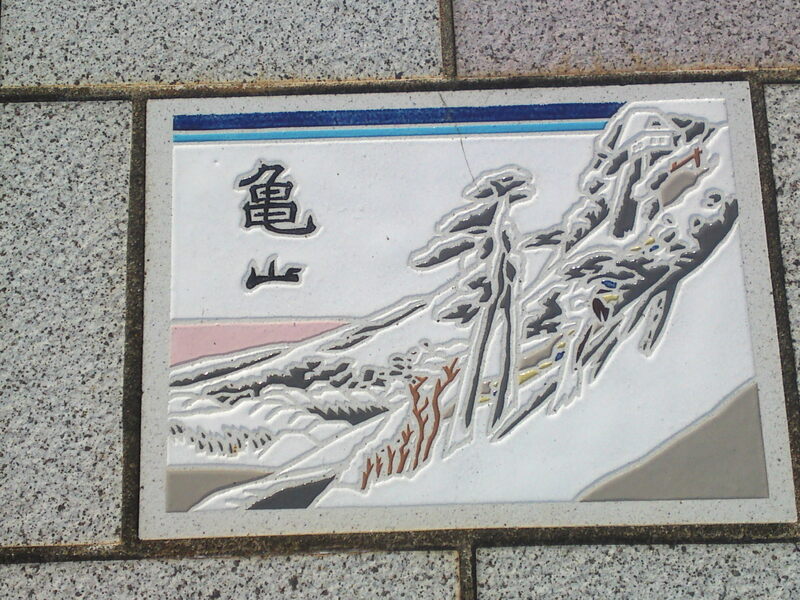 32nd station : Shirasuka (presently in Kosai City)! 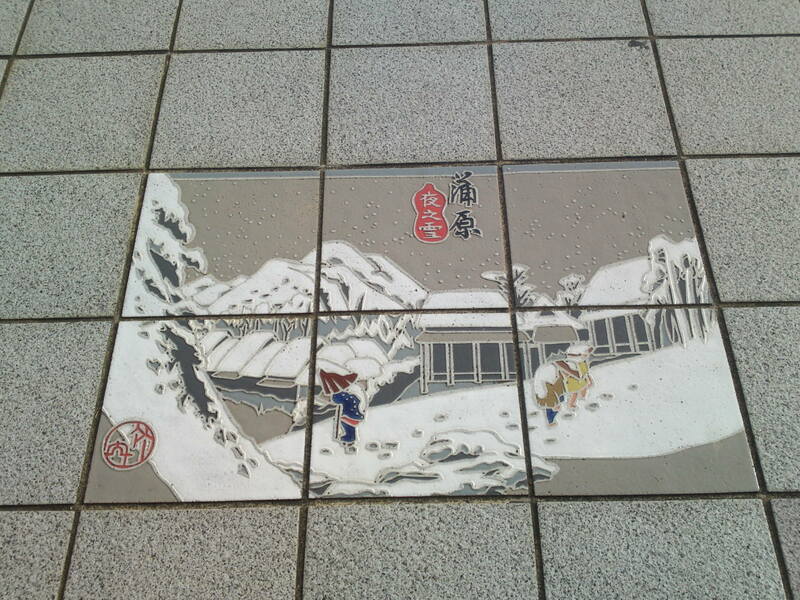 This is the last station inside Shizuoka Prefecture! 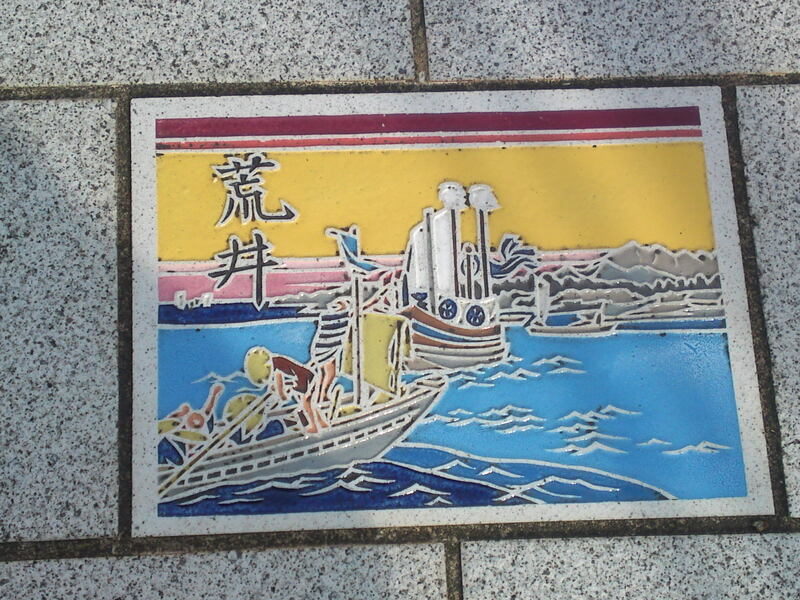 33rd station : Futagawa (presently in Toyohashi City)! 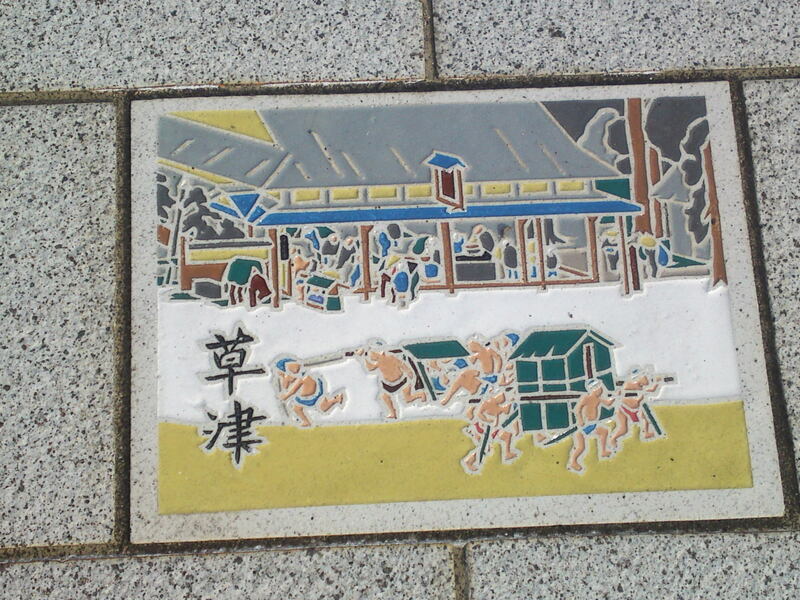 35th station : Goyu (presently in Toyokawa City)! 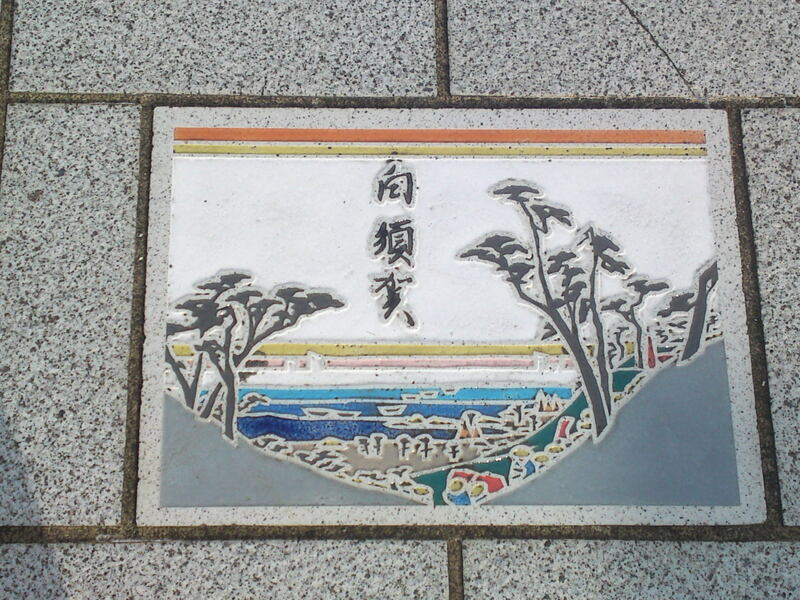 36th station : Akasaka (presently in Toyokawa City)! 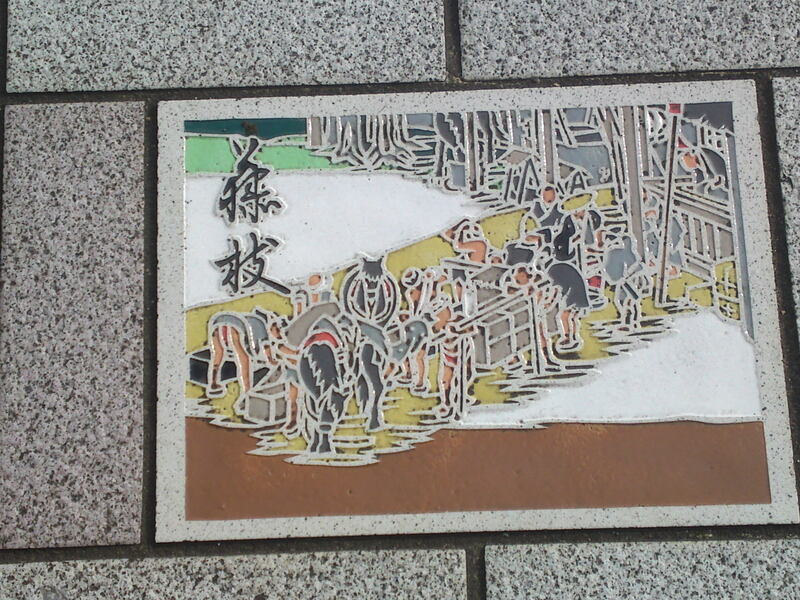 37th station : Fujikawa (presently in Okazaki City)! 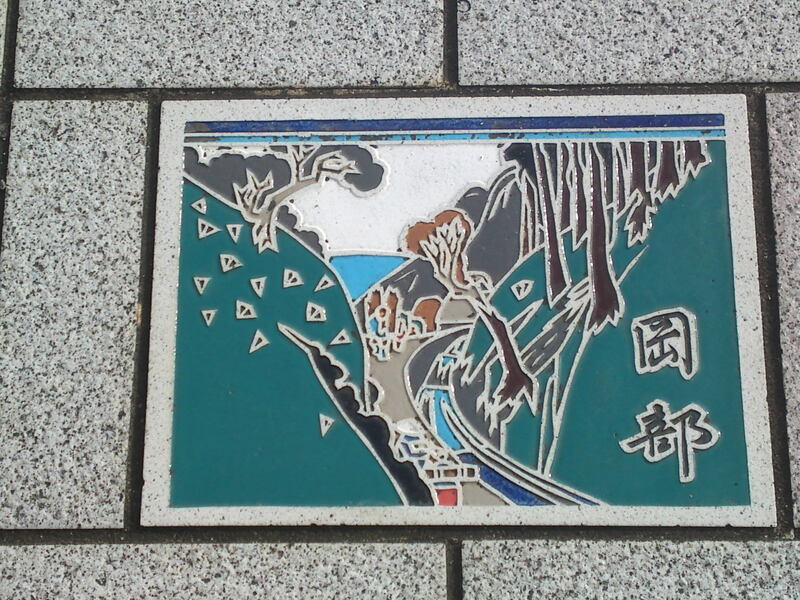 40th station : Narumi (presently in Midori Ku, Nagoya City)! 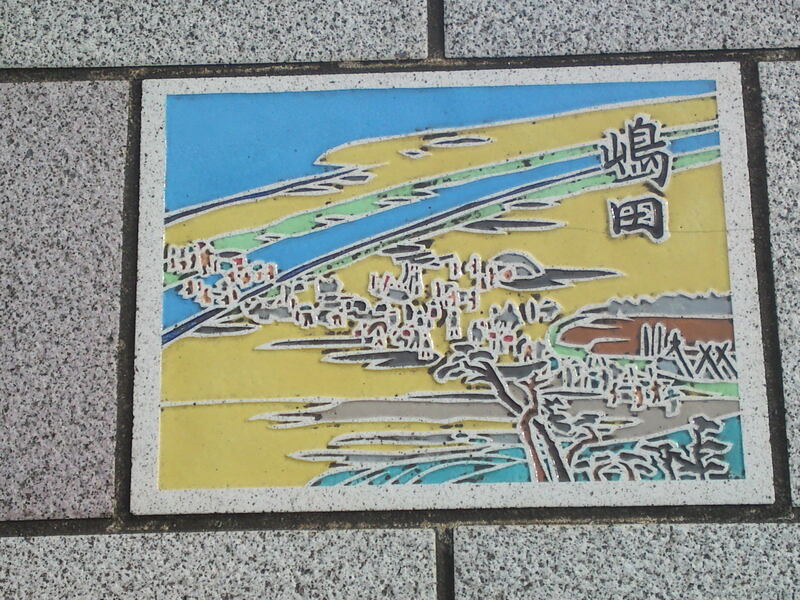 41st station : Miya (presently in Atsuta Ku, Nagoya City)! 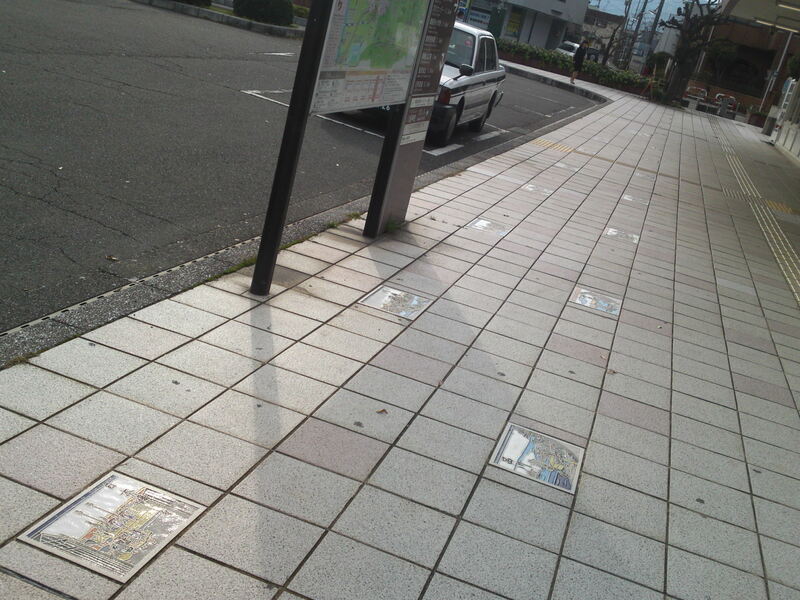 This is the last station inside Aichi Prefecture! 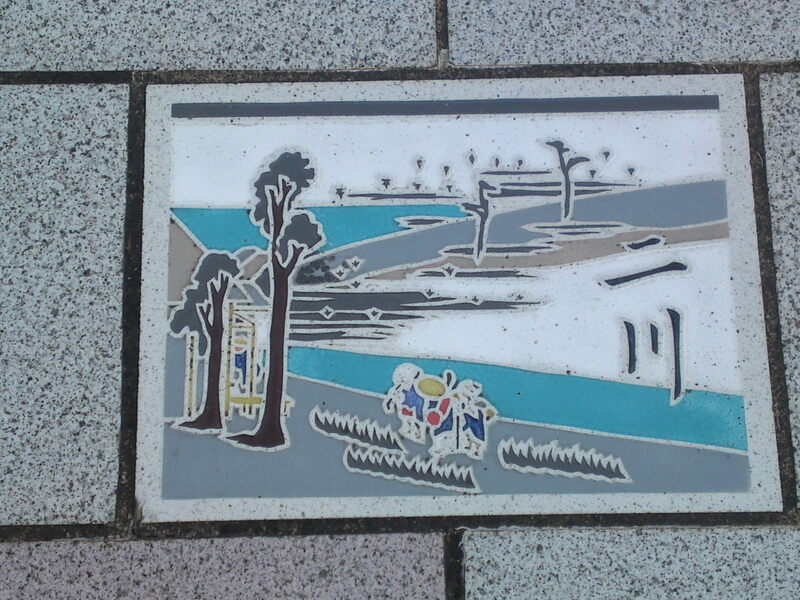 44th station : Ishiyakushi (presently in Suzuka City)! 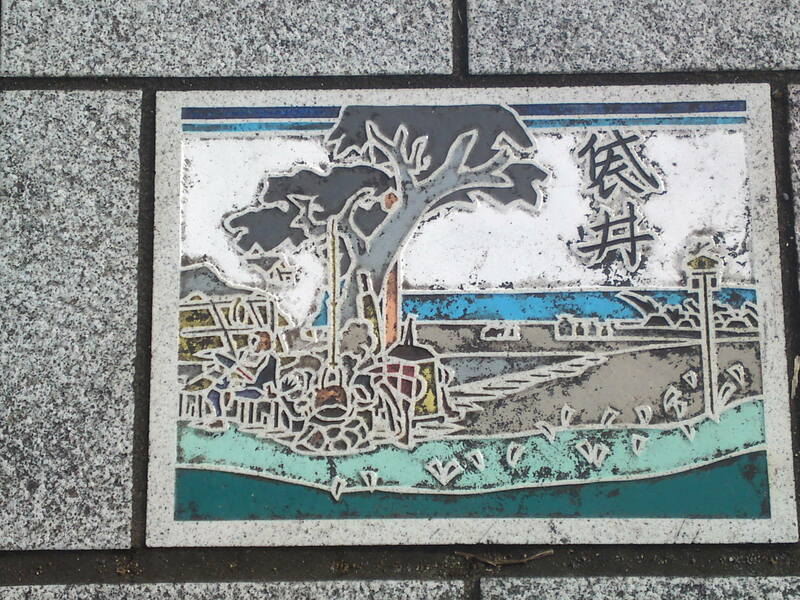 45th station : Shōno (presently in Suzuka City, Mie Prefecture)! 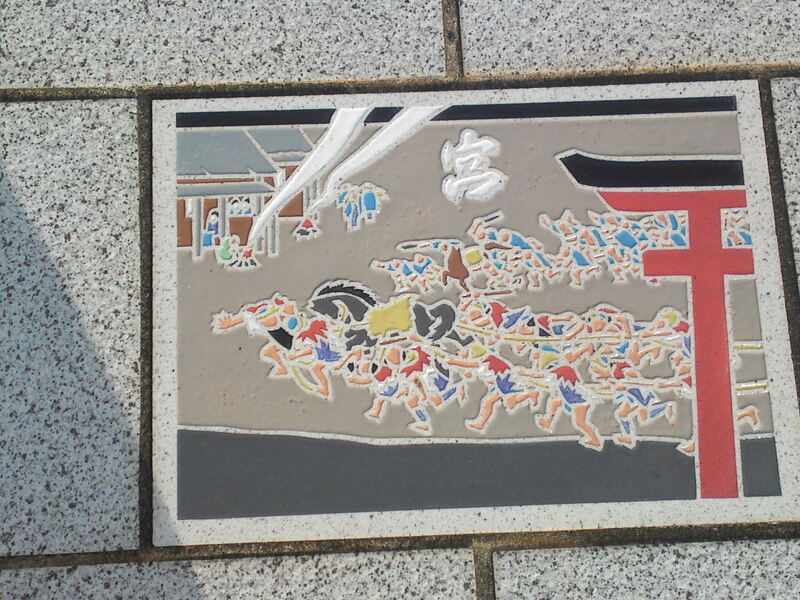 47th station : Seki (“the barrier”), (presently in Kameyama City)! 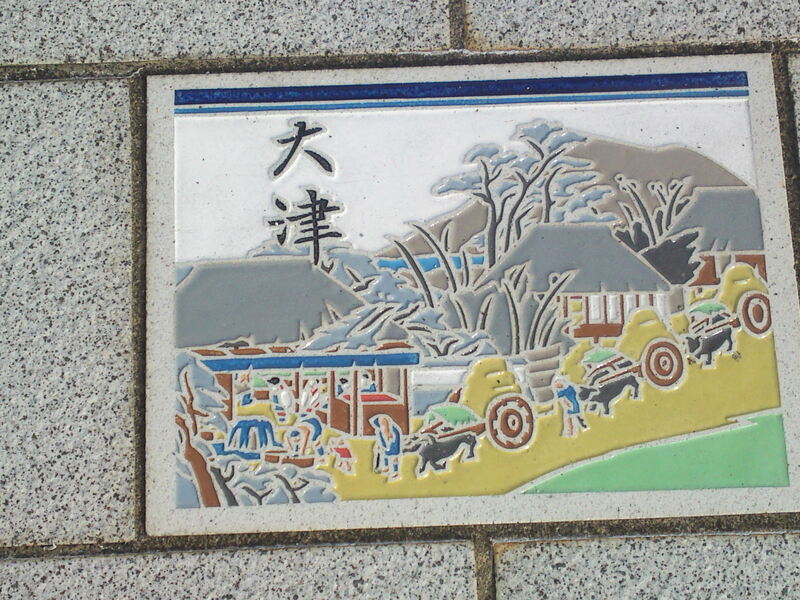 48th station : Sakashita (presently in Kameyama City)! 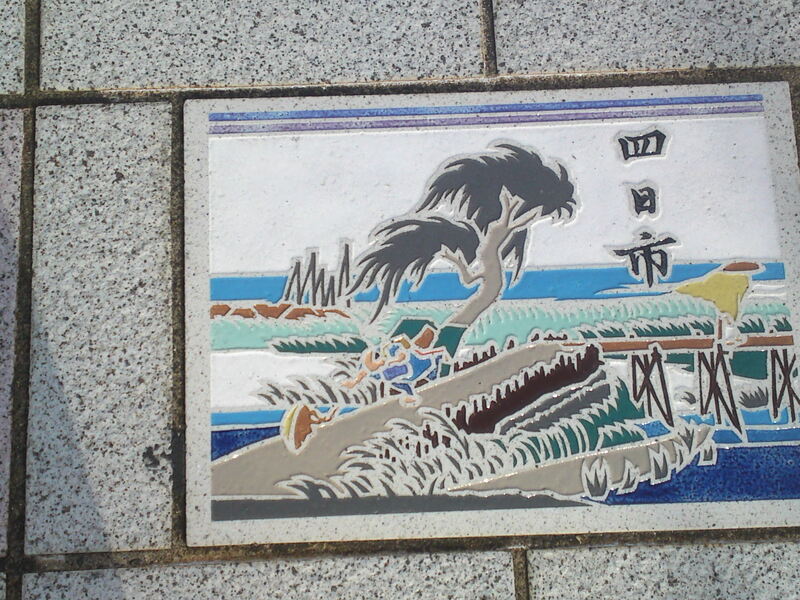 This is the last station inside Mie Prefecture! 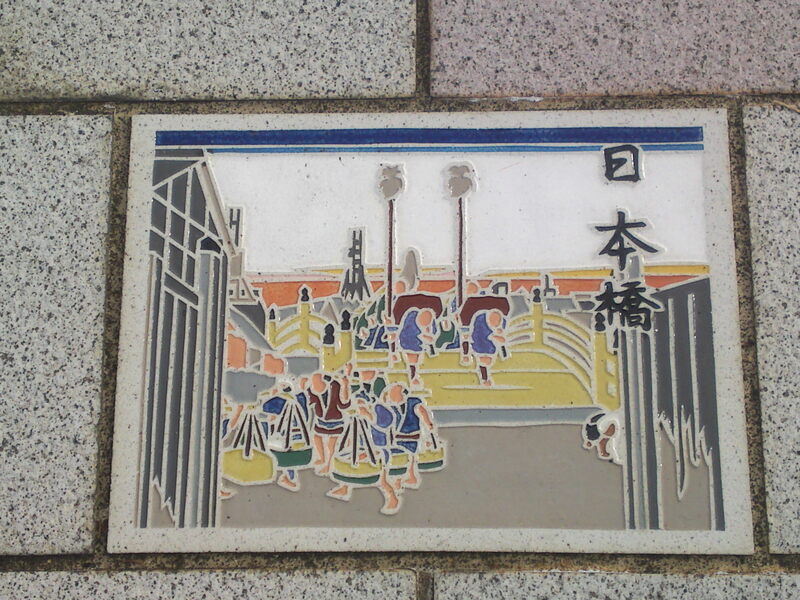 49th station : Tsuchiyama (presently in Kota City)! 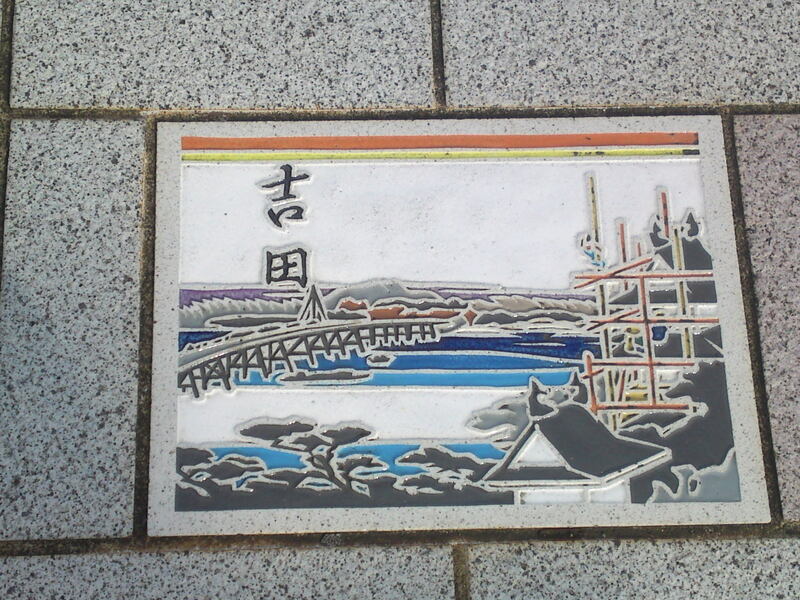 50th station : Minakuchi (presently in Kota City)! 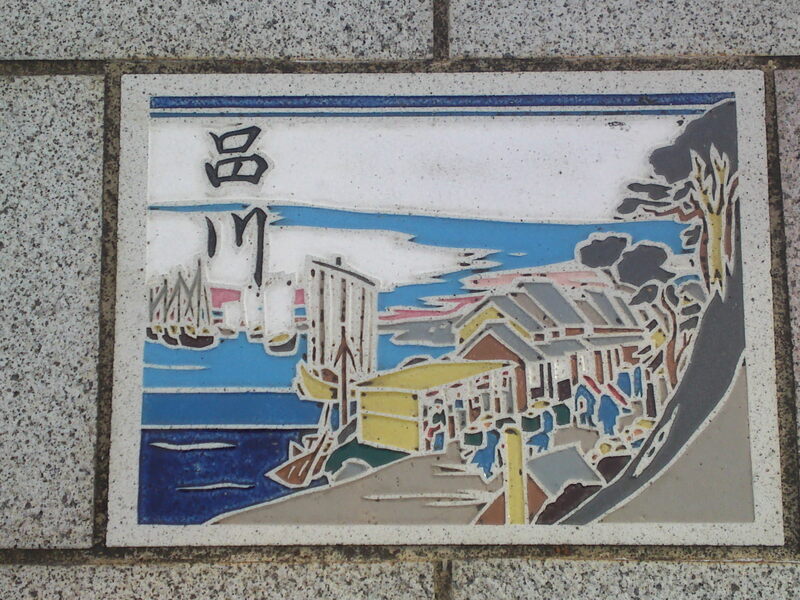 51st station : Ishibe (presently inside Konan City)! 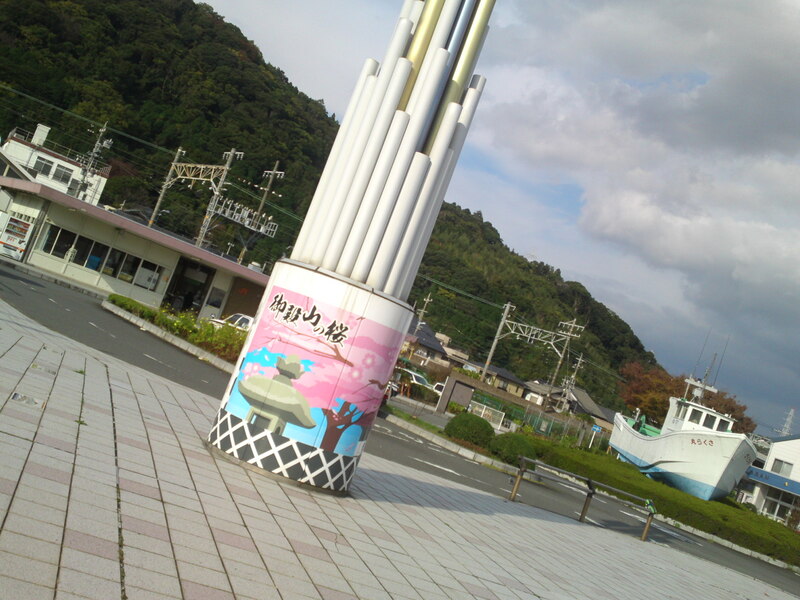 This is the last station inside Shiga Prefecture! 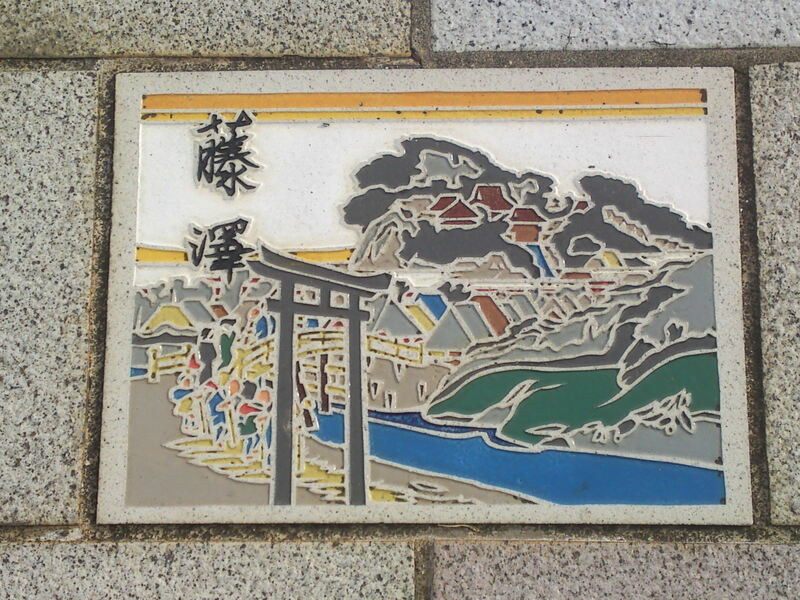 The end of the Tōkaidō: arriving at Kyoto (actually at the time Sanjō Ōhashi (the bridge spanning over Kamo River) at Keishi (“the capital”)!